MACHINEGUN THOMPSON'S PAGE: SPECIAL GUEST POST: DENIZ TEK! SPECIAL GUEST POST: DENIZ TEK! 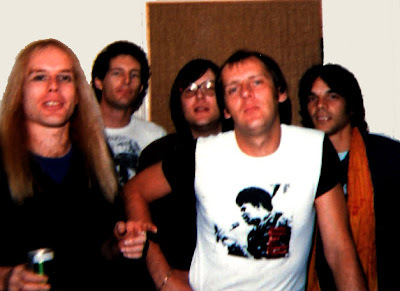 Radio Birdman (wiki) broke up in 6/78 after a long British and European tour. We had recorded our album "Living Eyes" at Rockfield Studios, but had no immediate outlet for it. There was some animosity. Warwick was very unhappy, and I had no expectations of being able to work with him again. We sort of drifted back to Australia, at loose ends. For me that meant my eventually resuming medical studies. 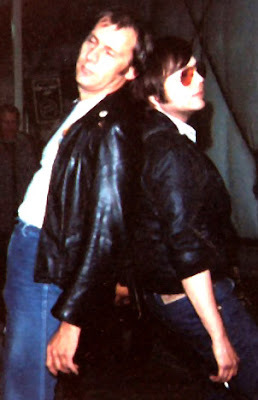 I had been friends with Ron Asheton for years, and spent a lot of time hanging out in Ann Arbor with him that summer of 78 before heading south. We had written music together and wanted to do something. After the Stooges broke up he had been in the New Order with Dennis Thompson and Jimmy Recca, and subsequently was in Destroy All Monsters. Ron, Dennis and I got together and jammed on some new material. It was great meeting Machine Gun Thompson, who I considered to be one of the greatest rock drummers of all time. 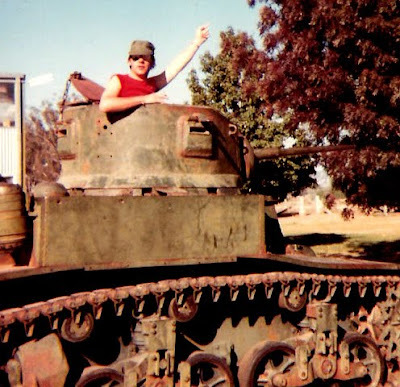 Ron described playing with Machine Gun, compared to others, as "like driving a Ferrari" ... unlimited power, speed, and you better know what the f*ck you are doing. I agree with that...Dennis told me once that his influences included both Keith Moon and Elvin Jones. He incorporated the best of both into his own style. By 1979 I was playing in The Visitors in Sydney, and the Living Eyes album was mostly forgotten except for a few pirated tapes that had leaked out. I went back to Detroit, and for most of 1980 Angie and I lived close enough to Bookies Club to throw a rock at it from our balcony. Often when DAM played there, if I wasn't working at the hospital, I walked over and played guitar. Around that same time, Trafalgar Records had negotiated a deal with WEA to release the Living Eyes album from a safety copy of the mixes that I had kept. The master tapes were in limbo as no one had actually paid Rockfield for the 3 week live-in sessions. The only problem was that there was no band to promote the album with shows. 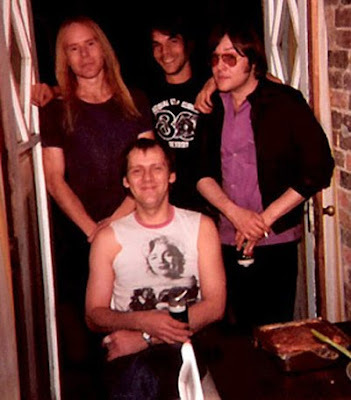 It was impossible to rebuild Radio Birdman at that point, the personal enmity level being too high. It would have been like walking into Chernobyl before enough half lives of radiation had gone by. 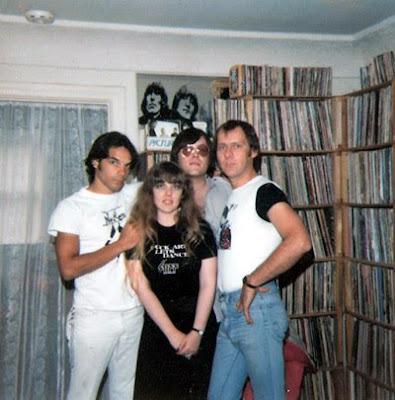 Angie had the brilliant idea of putting together a new band, which would be a workable hybrid of Radio Birdman, able to promote the release of Living Eyes. It gave Rob, Warwick and I an acceptable forum to work together again, and also give us the opportunity to incorporate our American comrades in arms. Trafalgar liked the idea. 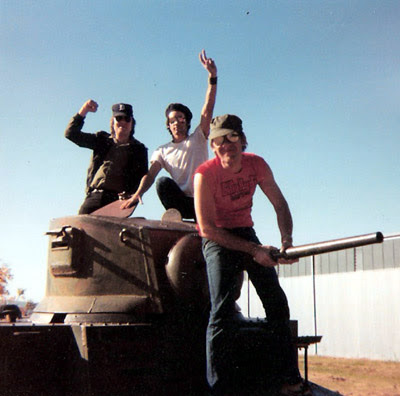 We planned a tour around Australia and a live album would be recorded near the end of the dates. I called Ron, and he recruited Dennis. 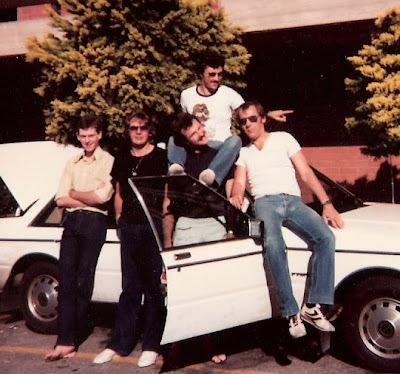 They arrived in Sydney sometime in April of 1981. We called it the New Race, out of a short list of suggestions. I think that name was chosen for convenience and the recognition factor. Being our most well known song from the past, it was functionally as close as we could get to calling it Radio Birdman. This seems weird to me now. In retrospect should have just formed a totally new band with it's own unique name, but things were unstable then personality wise with all kinds of weirdness. Dennis and Ron must have thought we were crazy. Rehearsals were in Sydney. I recall a few "control" issues cropping up between myself and Ron, but nothing too difficult. It would have been easy for me to take second chair, having the greatest respect for Rons playing, but it was my turf and I wanted to assert myself I suppose ... probably totally unnecessary. We remained close friends through it all. By the time we hit the road all those issues were resolved. One day we sat around and wrote a new song. The main topic was the first launch of the space shuttle, which was going on at the same time. Ron wrote the main riff. Dennis came up with the chorus which reminded me beat wise of Bill Bruford. I contributed the middle 8. We all kicked in on the lyrics. It took about an hour to write and arrange the whole song. Sad TV from the Visitors; the MC5's Lookin' At You which Radio Birdman had covered in the past; Gotta Keep Movin' which Dennis wrote for the MC5, Loose from the Stooges, November 22 from D.A.M. and others. Dennis showed us a cool ending for Lookin At You that the "5" used to use live, which had not appeared on any of the known recordings. We felt priveleged to get this "inside" MC5 info. This ending would resurface again in 2003 when I played on the DKT-MC5 world tour. It was not uncommon to crest a hill and find yourself facing two semis passing each other coming straight at you and nowhere to go except off the shoulder. My old friend from Ann Arbor, Gabor Bunda, was on the road crew and did much of that harrowing drive. 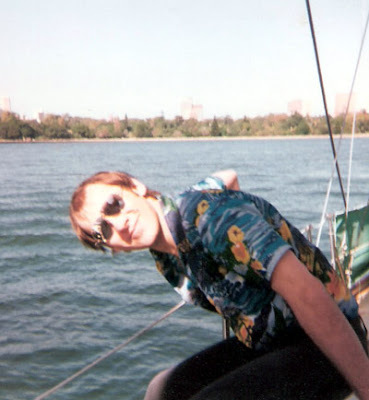 John Sweeney was in charge of the crew. Ron called him "Sween Boy". Steve ---- was the tour manager provided by the Harbour agency. He of course flew up the coast. When we arrived at the Gold Coast .. 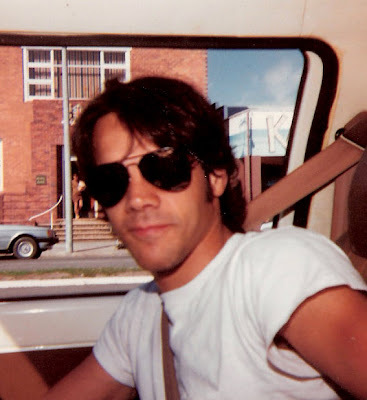 I cant remember if it was the Beenleigh Tavern or the Playroom ... the marquee out the front of the venue had us billed as Radio Birdman. This would be an ongoing pattern of venue behavior for the next 20 years we would endure and come to expect in all of our bands, but it was new and infuriating to us then. Also our accom wasn't organized. We found Steve in a luxury penthouse suite with a girl, in the mid afternoon, and Dennis rousted him out of bed in his underpants and read him the riot act. It was really funny, but also so typical of these agency guys setting things up very nicely for themselves while the soldiers on the front line are left hanging out to dry. Anyway Machine Gun scared the dude badly and he went out and got the marquee fixed etc. 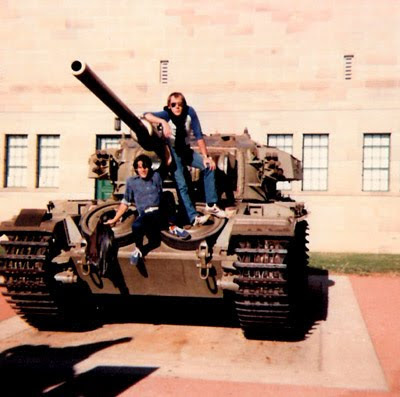 In Canberra we went to the War Museum, took pix of the guys on a tank. They put a great live shot on the cover of Ram Magazine. 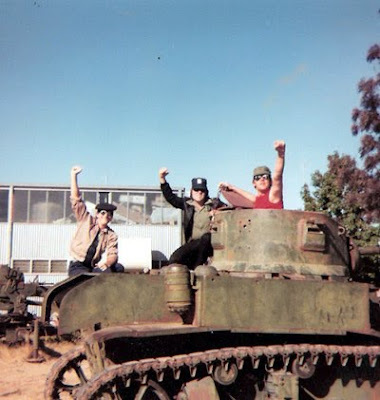 Ron Asheton the squad leader and spiritual advisor, gave us all dietary advice. Rob was having some stomach problems and he got special attention. (We knew that Ron had put the Stooges on a full zen macrobiotic diet and look where it got them!) His health program did not extend to any restrictions on smoking, of course. We started calling the band Fried Rice. To American ears the Oz pronunciation of "Race" sounds like "Rice". So we were the New Rice for awhile and then as the road took it's inevitable toll and we got more and more cooked, we became "Fried Rice". I recall at some shows The Church opened for us. I believe they became quite successful later. Rather than describe our sound, or what the shows were like, I will just refer readers to the live album for actual listening. The shows were rowdy, mostly packed, and very powerful. There was a lot of guitar interplay. In many ways they were like Radio Birdman shows, having attracted much the same crowd. And really not much different from crowds I recall at MC5 shows in 1968-69, except that the main drug here was alcohol. In Sydney we played at Selinas, Sgt Peppers, and the Crystal Ballroom. Chris Masuak joined us for the Sydney shows, adding a third guitar part in Looking At You. This added a great over-the-top element and I think it was quite exciting. It was good to hang out with Chris again. We drained a bottle of tequila backstage at Sgt Peppers and Chris ate the worm. These Sydney shows were all taped for the live album. Real tape was used, I think mobile 16 track. This was before the days of digital recording. The tapes came out great, the band being at its peak, and the recording quality was top notch. Rough mixes were distributed to the band members for review. Rob as usual, hated his vocals. For the final tracks selected for the album, he re-did all of his vocals in the studio. Because it was impossible to separate them, my backing vocals were tossed out too, and were apparently redone by Clyde Bramley. These tracks actually sound quite good and very much like me, maybe better. Although I guess they had no choice, I had been happy with my live vocals and was a bit upset that it was redone without telling me. The resulting album was released in Australia on WEA, England, and Germany on Statik on both CD and vinyl. Maybe elsewhere too. It was called "The First And The Last". I believe it stands as one of the finest live albums ever recorded. After the tour finished, there was a dispute over pay. The Americans left feeling they had been shortchanged. I do not know the details of why or how this happened. 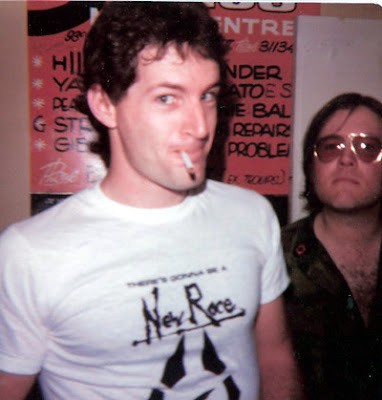 Several years later, Ron sold his copies of the rough mixes from the three shows to Revenge Records in France. He was destitute at the time, and felt that he was still owed money from the tour. This exchange resulted in two albums, technically bootlegs because Trafalgar still owned the performances. These were released on both CD and vinyl. 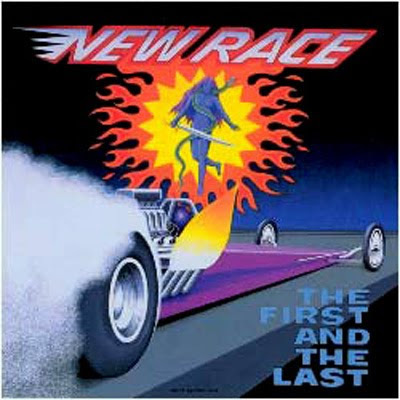 The New Race was a great rock and roll band. It should have continued. My circumstances at the time prevented it. I regret that. I will always treasure the experience. Ron has, sadly for his friends and the world, passed away. I hope to one day play with Dennis again.